THE HAGUE – St. Maarten/Italian casino boss Francesco Corallo may remain incarcerated in St. Maarten for another year, as his actual extradition to Italy may not take place until the summer of 2018. This is due to a full procedure that needs to be followed because the European extradition regulation does not apply in St. Maarten. 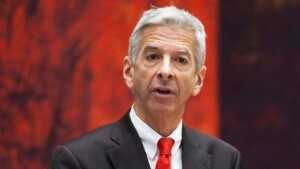 Dutch Minister of Home Affairs and Kingdom Relations Ronald Plasterk suggested this in a letter sent to the Second Chamber of the Dutch Parliament on Friday in which he provided an update on Corallo’s incarceration and pending extradition on the request of the Second Chamber’s Permanent Committee for Kingdom Relations. Committee member Ronald van Raak of the Socialist Party (SP) had specifically requested information on Corallo’s location of incarceration, the extradition trajectory and the expected date of extradition, during a meeting last week Wednesday. Emphasising that Corallo’s incarceration and extradition was a matter of Country St. Maarten, Plasterk confirmed that the suspect had been arrested on December 13, 2016, for extradition purposes on the request of Italian authorities. His extradition detention was vetted by the Judge and ruled to be legitimate. Corallo has been incarcerated at the Philipsburg police station since that date. A transfer from St. Maarten to Curaçao planned by authorities was ruled unlawful by the Judge because the formally binding rules of Country St. Maarten did not allow this. The proposed transfer was against Corallo’s will. Plasterk explained that since his arrest, Corallo’s lawyers have submitted a request for elimination of suspension of the extradition detention in Court three times. All three requests, filed in January, March and April 2017, were rejected. Italy’s extradition request was submitted to the St. Maarten authorities in a timely manner and through the correct channels. The handling of the extradition request will take place in the Court in Philipsburg on May 16. The session was previously planned on March 21, but this date met resistance from Corallo’s lawyers, who argued that this was too soon. According to Plasterk, the entire extradition process will have to be followed because the European Detention Order (“Europees Aanhoudingsbevel” EAB) does not apply to Dutch St. Maarten. This regulation applies in French St. Martin and the other suspect in this case, Rudolf Baetsen, who was arrested on the French side, has already been extradited to Italy. The full extradition procedure that now has to be followed in St. Maarten in Corallo’s case includes the option of filing an appeal at the Supreme Court in the Netherlands. “Practice shows that this can take up to a year. This means that the actual extradition may only take place in the summer of 2018,” stated Plasterk.